Daybreak Games and the Comic-Con Museum announced they will host “EverQuest 20: A Living Legend” this month. The event will occur from April 27th through April 28th (Saturday and Sunday), to celebrate the franchise that popularized MMORPGs 20 years ago. In addition to showing off original art, the exhibit will be accompanied by special programs and panels, which are listed below. The event will be hosted at The Comic-Con Museum’s future home in Balboa Park (2131 Pan America Plaza, San Diego, CA 92101). The original art, concept work, and other key items will be arranged into a community-focused EverQuest timeline, spanning two decades of active development and gameplay. The Museum gallery will feature original oil paintings by renowned fantasy artist and illustrator Keith Parkinson, the first game design document by Brad McQuaid, and original box art. Attending fans will also be invited on an EverQuest adventure inside the museum where they will solve challenges to receive exclusive rewards. 10 AM – 4 PM: EverQuest 20: A Living Legend: Exhibit Hall Open. 11 AM: Exploring the World of Norrath: Join game developers as they introduce EverQuest and explore 20 years of evolution and expansion in the world of Norrath. 1 PM: Living the Legacy: Senior members of the EverQuest development team will describe what it is like to work on the game they once played, exploring how their ongoing efforts ensure the game and its community continue to thrive. 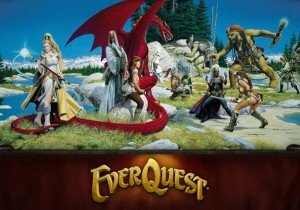 2 PM: Developer Signing: Members of the EverQuest team will be signing and distributing exclusive EverQuest 20 posters featuring the game’s original key art from 1999. 2:30 PM: Fan-Made Experiences, Community Forum: Join active members of the EverQuest Community as they explore and discuss the experiences that have defined 20 years of gameplay. The audience will have an opportunity to share their stories as well! War of Angels Closed Beta begins on November 3, 2010 and runs until November 12, 2010. Neowiz will be publishing War of Angels world-wide.